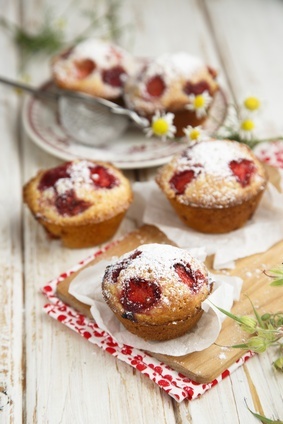 Wonderful homemade strawberry muffins from scratch are a great start to a morning. Light and full of sweet strawberries; they are a cinch to make. The night before, I will sift my ingredients together and have the muffin pan ready, so when I wake up I don't have a lot to do to make these. I always butter these beauties, but you may also use a simple glaze of powdered sugar and water. It's up to you. Offering a fresh strawberry banana muffin recipe and strawberry rhubarb muffins from scratch below. In a large bowl, combine the flour, sugar, baking powder and salt. Combine eggs, milk, oil and strawberry extract. Stir into the dry ingredients and mix JUST until incorporated (there will be lumps). Fold in strawberries. Spoon into greased muffin tins (don't fill more than 3/4 full) and sprinkle tops lightly with white sugar. You may also use sanding sugar which reflect light and makes the muffins look beautiful. Bake for 18 to 20 minutes or until golden brown. Run a knife around the muffins before you release them from the pan. They have a tendency to stick at times. If you want to reheat these beauties (or any other muffin for that matter), just wrap in foil and place in a preheated 325 degree oven for about 8 to 10 minutes. At that time you may drizzle with a glaze if you wish. You may want a topping for these homemade strawberry muffins instead of strawberries. Your choice; strudel or glazed muffins. Combine the topping ingredients, using a fork, pastry blender, or fingers, working until the mixture is crumbly. Sprinkle the top of each muffin with a generous amount of crumb topping. Melt the butter and add to the remaining ingredients. Stir until smooth and creamy.